Quite obviously, the smurfs were Communists. Come on: sharing the wealth; every smurf got a free home and free health care — I’m assuming a free ride on Smurfette as well; she must have been pretty warn out. I suppose Papa Smurf had some sort of authoritarian and fascist inclinations, not quite so much a Stalin as a Jim Jones type of leader — sans the strychnine-laced kool-aide. Quite obviously the Smurfs were definitely the result of Soviet propaganda. Gargamel was most assuredly a metaphor of US global imperialism. He was constantly trying to capture the peaceful and loving smurfs in order to turn them into gold. Hell, the smurfs were probably promoting homosexuality as well. You can’t tell me with all those dudes and only one girl, there wasn’t a little “love that dare not speak it’s name” going on there? I absolutely loved watching Scooby-Doo — I’m talkin’ the early 70s Hanna Barbera version with guest appearances by the Harlem Globetrotters and Don Knotts and Phylis Diller. What’s more frickin’ fun than ridin’ around in a groovy Van with a team of mystery solving kids and a dog that talks. Everyone always swooned over Daphne, but I think Velma, underneath the shy, nerdy exterior, was the hot one. But what’s up with Shaggy? That dude was always stoned and gorging himself with food — not real healthy. I always thought Fred was a bit of a schmuck myself. Nothing can beat haunted house and ghosts — which always turned out to be someone who would have gotten away with it if it hadn’t been for those meddling kids. Summary: Scooby Doo = Commies! These were independent, freelance mystery solvers livin’ out of a Van, helpin’ each other out and supporting Shaggy and Scooby’s food and drug habits because they loved them. If it looks like a red and talks like a red and eats scooby snacks like a red: Commies! My name is Elmer J. Fudd, millionaire. I own a mansion and a yacht. Ah yes, Elmer Fudd. Now that’s a real American. The NRA must get a chubby thinking about him. Who better to promote gun safety than Elmer? Unfortunately he was always thwarted by that “waskelly wabbit” who was determined to impose his liberal gun-control agenda on Elmer, who was only exercising his 2nd Amendment right to bare arms. I also learned that getting shot in the face with a 12 gauge at close range causes minimal damage at best. In fact, I learned much about physics from Warner Brothers. Their political cartoons were indeed a treat — how come they never show those anymore? You know, the racist ones? My hero had to be Wile E. Coyote: Super Genius. He struggled ever so mightily against the oppressive Roadrunner who mocked his every attempt to capture him with a variety of ACME apparatus’ and contraptions. Wile E. was indeed a metaphor for the inevitable futility of life. Rather than putting his faith in supernatural beings for sustenance, Wile E. had a firm belief in science, and through science, he ultimately failed in life. Lesson: don’t trust in science. I’m sure Wile E. was an evolutionist while the Roadrunner was quite obviously a creationist whose belief in a higher power led him to outwit his nemesis. Who can forget the Flintstones? 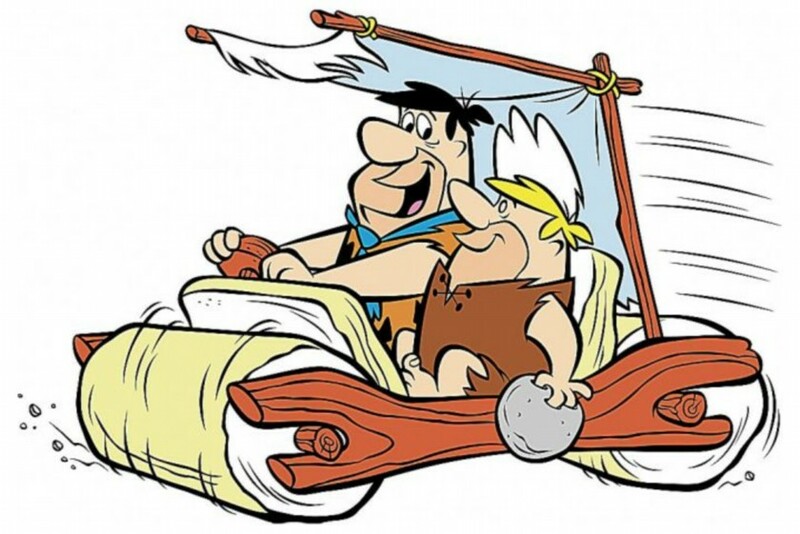 Even though it was originally made in the 60s, I still learned ever so much about the stone age. In fact, I learned much about class antagonism as well. Poor old Fred toiled away in the quarry, always struggling to get ahead and break free of his blue collar pre-destiny — but always to no avail. I learned that one better stick with their social class and be content, because change will never come no matter how hard one tries — even when an invisible alien named Gazoo comes to earth to lead you through life. This theme would be repeated in the future as well. Take the Jetsons for instance. Even in the future, we are still beholden to social strata even with robot maids and flying cars. I also learned much about feminism through these cartoons as well: women need to keep themselves in the kitchen and not hurt their heads with thoughts of a career and anything other than making her man happy. So boys and girls; what did we learn? I learned everything I needed to know by watching cartoons. I didn’t even explore such masterpieces as Heathcliffe and Beavis and Butthead and a litany of other self-defining and schema-building cartoons of my youth. Whenever there are questions not to be found in books or through rational observation, cartoons will always give one the answer they seek.